Men shaving their body was not a trend Gillette could not afford to miss out on. At the same time it’s also not a topic you can readily talk about. 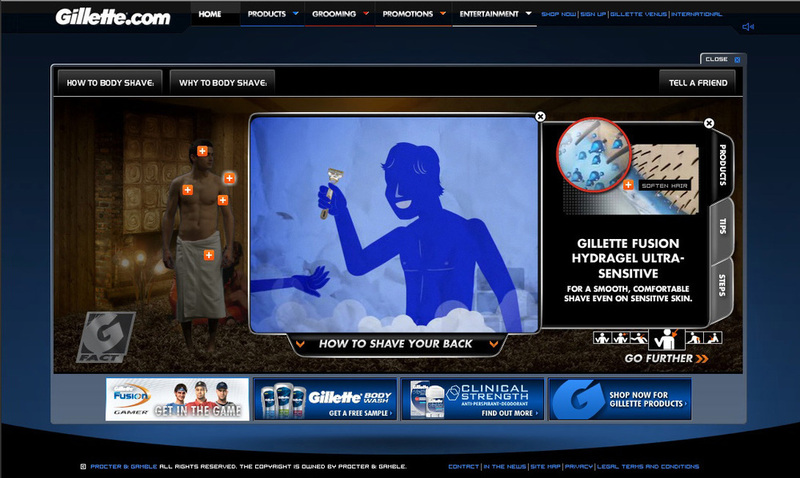 So, employing a touch of humor, some cool animated how-to videos and a live-action microsite, we created a place where Gillette could show guys the way. The result was press in places like Gawker and Perez Hilton all the way up to The New York Times. The animated how-to videos were also put up on YouTube and they became a viral hit, the groin video alone reaching 6 million hits (and counting.) This video sums it up well. We created animated videos that would live on a microsite. Those videos were posted on YouTube and linked to the microsite. The site featured live action video which we shot on a stage over a period of two days. It was broken down into sections based on various body parts. The work went on to win the Platinum Trophy at the AME Awards, receive an award from Applied Arts Magazine as well as The Caples Awards.